The historic Venable neighborhood was created to house UVA professors during the 1890s. The neighborhood's architectural designs show how the University expanded until the 1970s. ↑ Web. 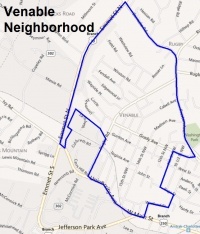 Neighborhood Page, City of Charlottesville, retrieved 22 Feb 2012. This page was last edited on 2 June 2012, at 12:30.